Vintage dimensions and look, a personal bronze patina developer and a modern workhorse with a great price. Oris released three new watches in the Big Crown Pointer Date Collection during Baselworld 2018 – two version in steel (leader strap and bracelet) and one in bronze. The brand chose a smaller 36mm case size, with an overall vintage look. 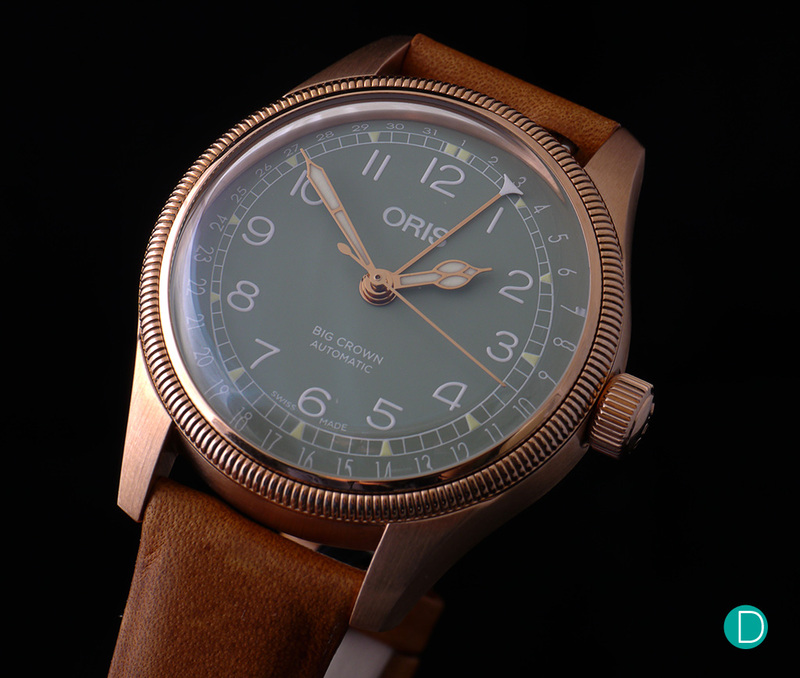 We review today the bronze Oris Big Crown Pointer Date Ref. No. 01 754 7749 3167 LS. This is a watch is made to impress. Oris Big Crown Pointer Date has a look uncommon for the year 2018: a 36 mm case and cathedral hands. Oris offers the watch in steel with a leather strap or a steel bracelet and in bronze with a leather strap. Oris categorise its watches in four categories: Diving, Culture, Aviation and Motor Sport. We reviewed the Aquis Master Diver Regulateur last year (the article contains a paragraph with brand’s history). We witnessed the launch of Carl Brashear Chronograph Limited Edition. The brand involvement in the saving and preserving the maritime life deserve a lot of attention. The Big Crown is widely known and recognised in the aviation world, back to 1938. The watch features an oversized crown to facilitate the handling for the pilots wearing leather gloves and a pointer calendar function. The Pointer Date was re-introduced in the collection in 1984. This year, the brand released an unusual 36mm series of Big Crown Pointer Date, from which the bronze version is an interesting combination of materials and colours. The Oris Big Crown Pointer Date in bronze is the first non-limited edition that features this case material. Though a material more commonly found in diving watches, with the obvious linkage to bronze diving gear, the new watch is part of the Oris Aviation collection. The 36mm diameter case has tapered lugs and an overall brushed finish. A round coin-edged bezel contributes to the vintage appearance of the watch. The watch is covered with a domed sapphire crystal with anti-reflective coating inside. The look is classical and perhaps unconventional these days. The case will develop a specific patina in time, and is part of the appeal. This uniqueness will debut once the collector will start wearing the watch. The air moisture, the PH of the wearer’s skin and the handling will create a story that will bind the owner with his watch in a tangible, visible way. The crown case features a screw-in big crown manufactured in bronze. The screw-in design often used for diver watches and offer a greater water tightness. The Pointer Date is fitted with a screw-in bronze crown. This design protects the stem and the correct handling from severe shocks. And of course the crown design benifits from better water resistance, rating up depths of 50 meters. The crown is indeed big for the watch size, but is totally in line with the classic and traditional Oris where the crown is oversized to ease the handle with gloves – an important property for a pilot watch. The case back is in steel with a cutout in sapphire crystal for a display back. The reason is to minimize the allergic reactions which may be caused by the oxides developed by the case. The Oris Big Crown Pointer Date bronze is escorted by a naturally tanned leather strap with a quick release system. The bronze pin buckle is narrow and some might can see it as a feminine touch. But this detail can be easily mitigated with the change of the strap and buckle. The Oris Big Crown Pointer Date Bronze is fitted with a pale green dial with printed numerals, Super-LumiNova® indexes and vintage looking cathedral hands, filled with Super-LumiNova® offering a great low light legibility. The dial falls also in the vintage impression that the Big Crown Pointer Date follows. The pale shade of green is inspired by a colour keyboard from the book “Le Corbusier’s Polychromie architecturale” – Charles-Édouard Jeanneret. The dial is adorned with printed Super-LumiNova® Arabic numerals in a sublime art deco font. The minute railway track features Super-LumiNova® hour indexes. The outer track is used for the calendar’s date indication. The beauty of the dial is completed by the polished central rose gold-plated hands. The hour and minute cathedral hands are filled with Super-LumiNova®. The date’s pointer has the tip painted in white for a good visibility and to make a distinction from the simple seconds’ hand. The legibility is excellent, the chromatic balance is charming, with a warm note. The brand’s name is printed in white on the upper side and the name of the watch and “automatic” on the lower side. Oris uses for the Big Crown Pointer Date the calibre 754. This movement is based on the Sellita SW200-1 – a hard working and reliable movement, created as an alternative for the ETA2824. The SW200-1 is a technical upgrade of the older SW200, part of the Sellita’s improving program. The update can be found of the teeth’s geometry of the gear train and offers a greater resistance against shocks. Oris Big Crown Pointer Date is powered by the Oris Calibre 754. 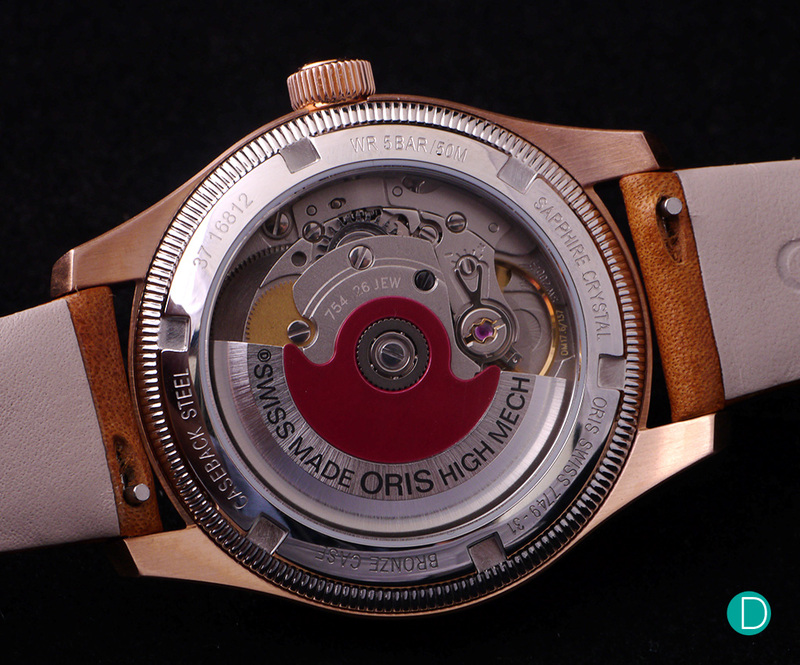 The red decorated rotor weight is a trademark of Oris Watches. Oris personalisation includes new engravings on the movement, a red painted rotor featuring black printed “Swiss made” and brand’s name. The date ring is changed to a pointer indication. Calibre 754 offers 38 hours of power reserve regulated by a 4Hz balance wheel. The finishes are not spectacular, the movement being machined produced and decorated. 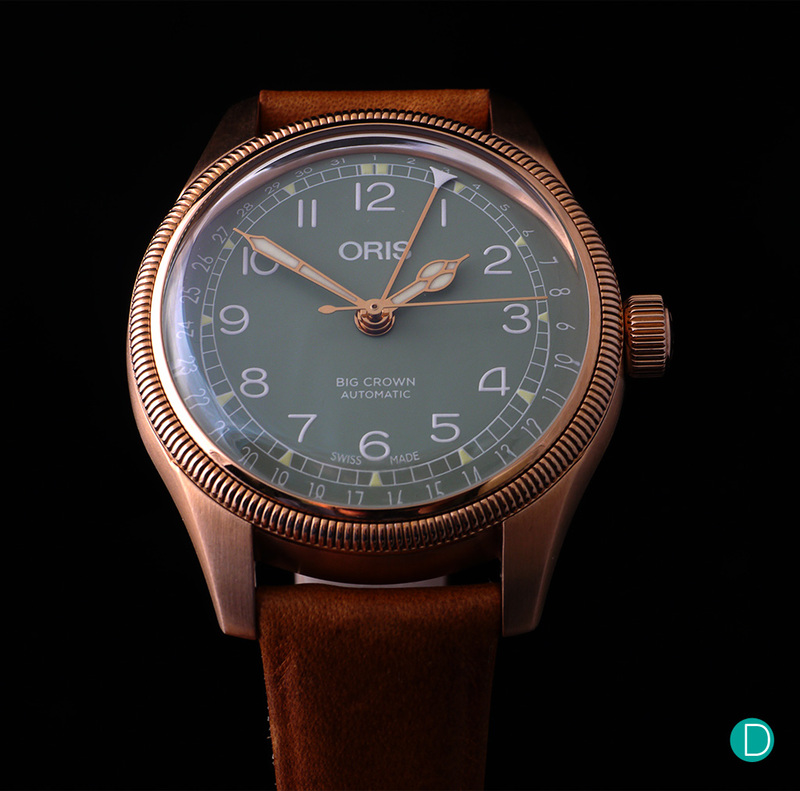 Priced at CHF1,800 / €1,700 / S$2,600 the Oris Big Crown Pointer Date is a viable solution for those wanting a bronze watch with all the advantages that it brings. Is important to note that the Oris is pilot watch and not a diver. The price is hard to beat, being one of the best from the traditional brands. One can find bronze watches from microbrands, but caveat emptor. The first pilot watch in bronze that comes to mind is the Zenith Pilot Type 20 Extra Special priced at US$7,600. The watch comes in a large 45mm bronze case with a big onion crown. The watch offers and excellent legibility due to its large Super-LumiNova® numerals. The Extra Special is powered by the Zenith in-house calibre 679 “Elite” automatic movement. It operates at 4Hz and has a power reserve spanning over 50 hours. Definitively, the Zenith watch is on the other extreme in the matter of size but comes with its own charm and fans. Last year, IWC introduced Big Pilot’s Watch Heritage in bronze. 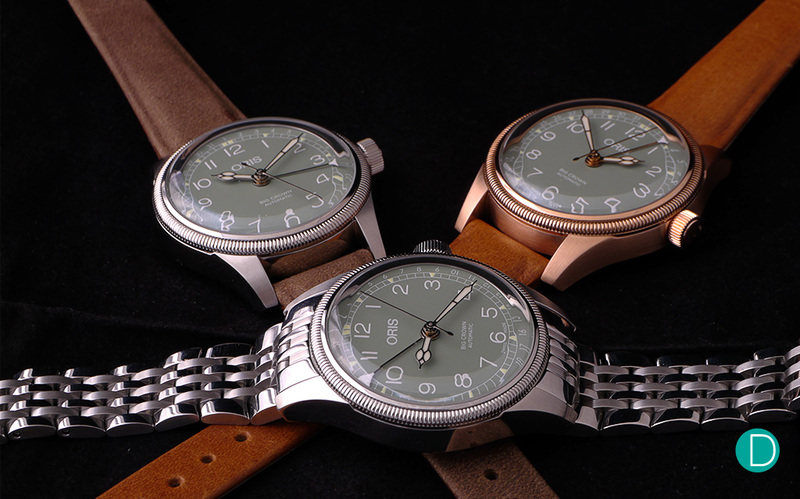 As other more common pilot’s watches, the case is bigger than usual – 46.2mm. The dial is marked by generously sized indexes and numerals offering, as expected, excellent legibility in low light condition. The IWC’s pilot is powered by the Calibre 52110. This movement offers an impressive seven days power reserve. The watch comes with a price tag of US$13,200. The Oris Big Crown Pointer Date in bronze is a good looking watch with an excellent price. The 36mm diameter makes a good choice for a lady wishing something more than a fashion watch. In the same time, a gentleman with an affinity for vintage watches will find the bronze Big Crown an excellent modern choice. Some might argue that a 36mm diameter for a sports watch is not desirable for the simple reason that the Big Crown Pointer Date is not a dress watch. An important aspect of this watch is the bronze case. In time, it will develop a lovely patina according to the wearer’s habits. After some years, each timepiece will be unique, like its master. Did we mention the competitive price? The movement is partly responsible for the price. But at the same time is a robust workhorse, easy to maintain. The Oris Big Crown Pointer Date is a great choice for a lady wanting a more serious watch or a gentleman with a keen for smaller, vintage looking watches. 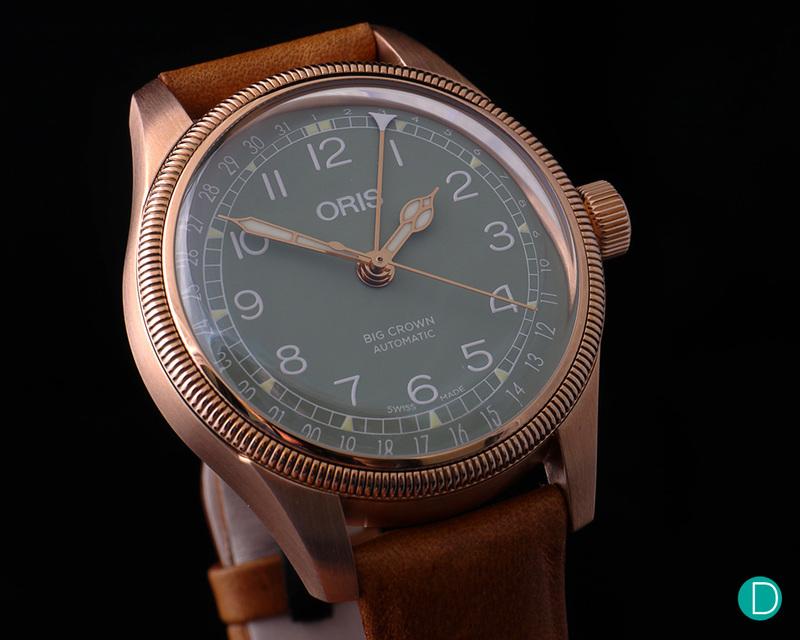 Oris Big Crown Pointer Date Bronze Ref. No. 01 754 7749 3167 LS is priced at CHF1,800 / €1,700 / S$2,600. More information can be found on Oris Website.